Tonight, Scott Pelley made the change permanent, announcing the studio will continue to serve the broadcast after moving from its longtime home of nearby Studio 47. “Viewers may have noticed the ‘CBS Evening News’ broadcast has a new look. The show now comes on the air from Studio 57 at the CBS Broadcast Center in New York, also the home of ‘CBS This Morning,'” mentioned Pelley during the broadcast. The “CBS Evening News” previously used Studio 47, which is also part of the CBS Broadcast Center in New York City with a newsroom backdrop. Studio 57 was designed by Jack Morton PDG and came online for CBS in 2012 as the broadcast facility was expanded. Recently, the studio was updated for the election, including a new monitor wall with the Cronkite map moving locations. 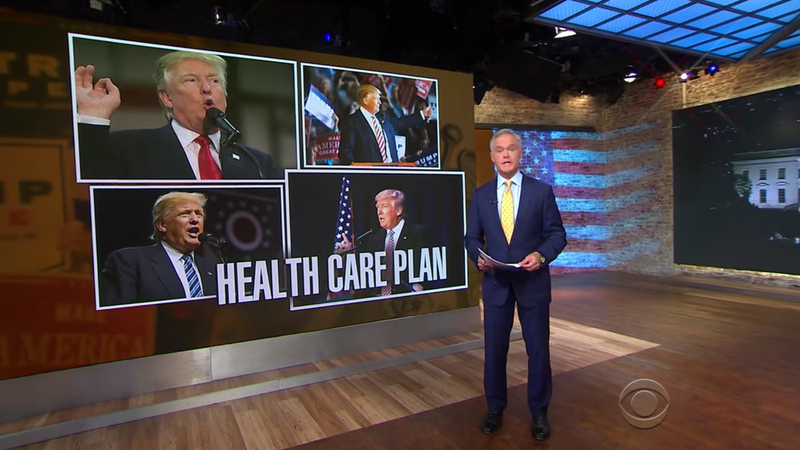 Standing for much of the broadcast, similar to the old studio, Pelley uses the twin monitor walls with topical graphics and jibbing camera shots.